Duct Cleaning Training Michigan Amistee uses its state-of-the-art training facility to provide hands-on training to each of its team members. "The owners of Amistee understand the importance of equipping our technicians with the most innovative and efficient methods and techniques in the air duct cleaning and insulation services industry. Each of our air duct cleaning specialists are trained according to the National Air Duct Cleaners Association (NADCA), which sets the highest standard in our industry. This ensures that our team members are prepared with the proper knowledge to provide a complete and thorough cleaning of your entire HVAC system. 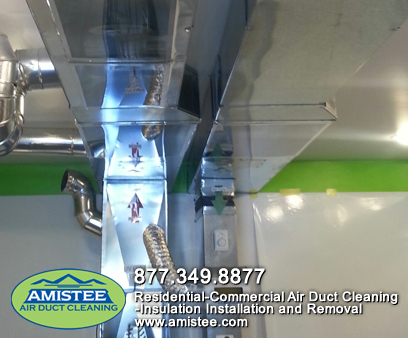 Amistee is dedicated to servicing the Southeastern Michigan community with an air duct cleaning and insulation services they can trust and we take great pride in our quality of work. This commitment is made evident in every step of our work but the owners understand that the first step to providing a professional service begins with the training of our technicians. This is why Amistee has taken an extra step in order to make sure you are receiving the professional level of air duct cleaning or insulation service your home deserves. Amistee offers an in-house training facility to each of its team members. This provides hands-on experience that can be used to teach new technicians and also to help established technicians maintain a level of expertise in a progressing industry. Amistee’s advanced facility offers a variety of models that simulate the HVAC systems that are found in both residential and commercial properties. It houses working furnaces with multiple duct systems and a fully functioning dryer. The duct work is made transparent so our team can visualize and grasp the differences in the industry-specific tools we use and what is happening within the interior of your ventilation system during our duct cleaning. The dryer is used to exemplify possible situations in dryer vent cleaning. The technicians are trained to handle different scenarios in order to completely comprehend how to expertly clean any vent system. The facility also offers a visual display of a variety of insulation products on the market today in order to teach our technicians the characteristics of each. Our training program includes classroom education, technical simulation, and hands-on experience in a learning environment. This intensive program provides our team members with practical knowledge and experience before they even enter your home. When our team members arrive at your home, you can be confident that they are well-prepared to provide a complete and quality service that you can trust. Amistee works hard to offer honest and professional services and preparation is the key to our success at achieving this goal. 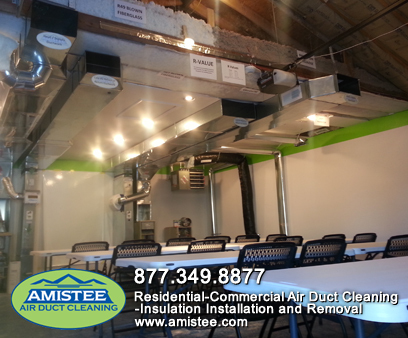 Our sophisticated training facility with its cutting-edge technology demonstrates Amistee’s commitment to a complete and thorough air duct cleaning or insulation installation or removal. We have been servicing the homes and businesses of the Metro Detroit area since 2004 and have built a reputation based on integrity and credibility. Each team member at Amistee is dedicated to taking the extra step in order to provide a service that will exceed your expectations. Call Amistee today at 248-349-8877 and let our highly-trained team members demonstrate our dedication to quality and professionalism. "